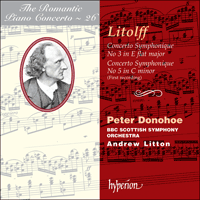 This recording is the companion to Donohoe and Litton's earlier recording of Litolff's Concerto Symphoniques 2 & 4 (CDA66889) and completes our survey of the composer's works for piano and orchestra (Litolff's first concerto was never published and is lost). Both works owe the 'Symphonique' title to their four-movement structure (all Litolff's concertos contain a Scherzo in addition to the three conventional movements), and the importance of the orchestra in their thematic development. The Third Concerto was (along with the Fourth) the most popular in Litolff's lifetime and was written for performance in the Netherlands. It uses two popular Dutch melodies which no doubt explains it early success. The Fifth Concerto is the most obscure of the four extant works yet it is the most ambitious in scale with a particularly imposing orchestral exposition. Unfortunately by the time the work was composed (1867) Litolff had faded from the public eye and the work received few, if any, performances. It's Scherzo, obviously modelled on the equivalent 'hit' piece from the Fourth Concerto, has the potential to be almost as popular, though it's virtuosic leaping octave passages are likely to deter all but the most muscular of pianists. The intelligent and characteristic physiognomy of Litolff apparently bears the imprint of agitations and moral tempests which have troubled his soul. Silver hair crowns a prominently developed forehead. His lean features etched on a pale countenance are fine and distinguished; but upon considering with attention his original and characteristic visage, one has the impression of premature age hastened by the storms of life. The unusual health hazards to which a great artist is exposed have given him a nervous tremor. It is true, though, that a career as rapidly moving as his would have destroyed nearly anyone else except himself. His life has been so much an idyll, a drama, and always a novelistic intrigue. Litolff’s father, Martin Louis Litolff, was Alsatian by birth and fought with Napoleon’s army in Spain during the Peninsular War. Captured by Wellington’s victorious forces, he was taken to England and released after the concord of peace. After settling in London Martin Litolff eked out a living as a dance violinist and married a Scotswoman, Sophie Hayes. Henry (Charles) Litolff was the couple’s only son. He received his musical education from his father until he was twelve, at which time the boy’s gifts were already conspicuous. At fourteen he was noticed by Ignaz Moscheles who was so impressed by his talent that he offered to teach him. Lessons continued with Moscheles (fees for which were generously waived) until 1835. Completely infatuated with a young Englishwoman, Elisabeth Etherington, he eloped with her to Gretna Green to escape the determined opposition of his parents. After they were married, the couple escaped to France, setting up home in the village of Melun near Paris. In the French capital he became acquainted with Pierre-Josef-Guillaume Zimmerman and the piano manufacturer Jean-Henri Pape, and spent much of his time developing his piano technique. A restive spirit, Litolff did not remain in Melun long. Pape introduced him to Fétis who engaged the young pianist to give a concert at the Brussels conservatory in 1839. Litolff played Beethoven’s Third Piano Concerto to great acclaim and attracted the patronage of the Duc de Looz who invited him to his estate near Wavre. There Litolff composed his first Concerto Symphonique in D minor, which has been lost. During this period he also separated from his wife who, somewhat penitently, travelled back to her family in England. According to Fétis, Litolff became embroiled in a scandal in Brussels from which he had to extricate himself rather hurriedly in 1841. Of the scandal’s nature we can only speculate, but it was probably a love affair of some kind. Aided by his friends he put Brussels well behind him by moving to Warsaw where, Fétis states, he was conductor of the National Theatre orchestra. Little is heard of Litolff at this time, but it has been suggested that this was due to either prolonged depression or even temporary insanity. His reappearance on the musical scene was marked by concerts he gave at the Leipzig Gewandhaus and in Dresden in 1844 and by the first hearing of his Concerto Symphonique No 2, Op 22. His presence, brilliant technique and eccentric musical style impressed the young Hans von Bülow, whose family befriended and supported him during the course of 1845. As well as teaching Bülow, Litolff enjoyed successful concerts in Prague and Berlin. His new-found fame, which approached that of Chopin and Liszt, restored his spirits, but he was nevertheless troubled by his matrimonial predicament and the public embarrassment it was causing. Suffering another bout of ill-health, Litolff returned to London in order to divorce his wife in the English courts. It proved to be a messy business and at the trial he was ordered by the judge to live with his wife or else pay her the sum of £2,000. Unable to pay the latter and unwilling to do the former, he was thrown into a debtors’ prison where he remained miserably for several months. Ever resourceful, he took advantage of a friendship with the jailor’s daughter and escaped to the coast in a farm wagon where, incognito, he was able to embark (probably with a sufficient bribe) on a fishing boat to Holland. Smuggling himself ashore, he managed to establish himself as a respectable musician, teaching and giving concerts in Utrecht and Amsterdam. There he composed his Concerto Symphonique No 3 in E flat, Op 45, which, as a tribute to the Dutch people, and in thanks for his safe asylum, incorporated two old Dutch tunes. The Dutch newspapers, enamoured with Litolff, dubbed him the ‘Vieuxtemps of the piano’. Dutch audiences were similarly besotted with him and the students of Utrecht even wrote a poem in his honour begging him not to forget them. Litolff, however, was keen to move on. During the summer of 1847 he convalesced in the Harz Mountains in the German duchy of Brunswick and composed his first opera Die Braut von Kynast which was first performed under Fétis’s direction in Brussels on 3 October 1847. Brunswick seemed amenable to him; there he made the acquaintance of Gottfried Meyer, the music publisher, and his wife Julie, who were to play an important future role in his life. In 1848 he went to Vienna where he soon became caught up in the Revolution. Championing the cause of freedom, he composed a march ‘in fraternal dedication’ to the Legion of Students of which he was a member. Emulating Wagner’s flight from Dresden, Litolff fled Vienna after a warrant for his arrest was issued. He sought refuge in Brunswick with the Meyers and was granted citizenship in 1849. Although he continued to travel (he made a second visit to Holland and gave concerts in Leipzig), his mental state was precarious and further bouts of depression and hypochondria followed. In 1851 a divorce from his first wife was finally effected and he married Julie Meyer whose husband had died in 1849. This enabled Litolff to take over the running of the publishing firm, the name of which was changed to ‘Henry Litolff’s Verlag’. Under Litolff’s control the firm published many works by the masters in cheap, affordable editions, and the inventory of works also included his own. Brunswick also enjoyed a period of artistic enrichment for Litolff undertook a series of festivals which included the presence of Anton Rubinstein, Liszt, Berlioz, Bülow and Moscheles. After a period of creative silence, probably owing in large part to his involvement in publishing after his second marriage, Litolff launched himself into the concert world once again. A third tour to the Netherlands saw the composition of his Concerto Symphonique No 4, Op 102, which was performed with great success there and in Belgium under Fétis. The Fourth Concerto, along with a revival of the Third, proved to be immensely popular and Litolff was carried along on the crest of this new wave of public admiration. His overtures, Maximilian Robespierre Op 55 and Die Girondisten Op 80 (much admired by Tchaikovsky) were also favourably received, but none equalled the approbation of the Fourth Concerto which was dedicated to the Duke of Saxe-Coburg-Gotha. The Duke became Litolff’s new employer, though the life of Kapellmeister did not satisfy the pianist for long. Bouts of depression continued to plague him and neglect of his second wife led to a divorce in 1858, after which Litolff moved to Paris. At a concert des jeunes artistes du conservatoire directed by Jules-Étienne Pasdeloup in Paris, Litolff scored a major success with the Fourth Concerto. Attending this concert was Berlioz who described the occasion as ‘the most brilliant day in the existence of the Société des Jeunes Artistes’ and gave an account of Litolff’s career. Litolff, Berlioz continued, was ‘a composer of a most elevated order. He possesses at the same time science, inspiration, and good sense. Yet a devouring ardour is at the bottom of his character and leads him necessarily to violence and exaggerations from which the beauty of his musical productions has always suffered …’ Litolff later shared a concert in Paris with Berlioz in which his third and fourth concertos featured along with extracts from his cantata Faust. Leaving his home in Brunswick behind, Litolff found solace at the country home of Count Wilfrid de la Rochefoucauld near Fountainbleau. There he fell in love with the Count’s daughter Louise and married her in 1860. Though little is known of this period of Litolff’s life, it appears that he found a new stability and decided to make Paris his permanent home. Though he continued to tour Europe as a piano virtuoso—during the period 1864/5 he visited Belgium and Holland, and travelled to Austria, Poland, and Russia in 1867—he devoted more time to conducting and to the composition of several operas and an oratorio. He also became well known as a piano teacher. Between 1867 and 1870 he was conductor of the Paris Opera and organised large-scale concerts of orchestral music of ‘modern and ancient’ music for which young composers were invited to submit new works for scrutiny and performance. The end of this period, which was to be Litolff’s last phase of fertile creativity, was marked by the premiere of his Concerto Symphonique No 5 in C minor, Op 123, in February 1870. Gradual decline followed. His operas made no impression with the public and his orchestral concerts disintegrated. Turning instead to light music and operetta, he presented festivals at the Théâtre du Châtelet and conducted concerts of light music at Frascati’s famous Paris restaurant and at a café concert on the Champs-Élysées. Three years after the death of his third wife (in 1873) he married for the fourth and final time to a seventeen-year-old girl who had nursed him back to health in 1875. In his last years he was afflicted with rheumatism though he still found time for composition, as is evidenced by the premiere of his last major work, the opera Les Templiers, in Brussels on 25 January 1886. He died at the age of 73 at Bois-Colombes near Paris on 5 August 1891. Henri Litolff was one of the last of the great composer-pianists of the nineteenth century. Although opera occupied much of his time after 1870, it was his five concertos, or Concertos Symphoniques (as they appeared in print), that punctuated the main part of his professional career. These works tell us much about the composer’s impressive technical abilities as a pianist, but more importantly, they provide evidence of a stylistic eclecticism that is Janus-like in its propensity to look back to the more classically orientated concerto style-forms of the first half of the nineteenth century (to Beethoven, Kalkbrenner, Moscheles and Chopin) and yet at the same time the bold harmony, rich orchestration, and rhythmic invention look forward to the second half, particularly to Liszt and Scharwenka. Moreover, Litolff’s style shares with Berlioz a vein of eccentricity in his harmonic progressions, use of orchestral timbres, and structural designs that is constantly engaging in its unpredictability and power to surprise. The distinctive generic title of Concerto Symphonique essentially derives from Litolff’s larger scheme of four movements (rather than the traditional three) designed to emulate the four-movement plan of the symphony, where a scherzo also forms a significant and (for Litolff) highly characteristic part of the work. Litolff’s four surviving concertos have also been described as symphonies concertantes, in which, it has been suggested, the piano plays the role of obbligato to the orchestra. This argument seems harder to justify. In his first movements, Litolff uses the orchestra to present all his main thematic material, but this in no way deviates from the conventional orchestral introduction or ritornello of the classical concerto of the late eighteenth and early nineteenth centuries, nor from the so-called ‘double exposition’ shared between the soloist and orchestra; more to the point, the role of solo and ripieno is played out in much the same manner as one would expect in a ritornello-sonata conflation of the Classical or early Romantic era. A comparison with the concertos of Beethoven, Chopin, Moscheles and Hummel bears this out. Furthermore, it is hard not to see the piano as central to the remaining three movements (especially the scherzo) not only in terms of the sheer weight of material it is given, but also in the very nature of the material itself whose character is determined by the technical nature and capabilities of the instrument and performer. Litolff’s Concerto Symphonique No 3 in E flat major Op 45 dates from 1846 while he was in Holland. Subtitled ‘National Hollandais’, it expressed a message of gratitude to the people of the Netherlands for his freedom after escaping from prison in England. The work therefore encapsulated a sense of liberty of personal significance to the composer, but it also communicates broader political messages of freedom. An implicit believer in the principles of the French Revolution of 1789, Litolff carried high the ideals of human liberty and democracy over the hegemony of despotic monarchical governments (ideals which nearly got him arrested in Vienna in 1848), a sentiment which is particularly evident in the martial confidence of the first movement. Moreover, the concerto’s incorporation of Dutch tunes served both to elevate a sense of nationhood in Holland as well as that of adjacent Belgium who had gained freedom from rule by the House of Orange in 1830. With the sound of wind band and timpani, the first movement opens with a military air. Such an idea might have emanated from a ‘revolutionary’ opera of Méhul, Cherubini, or Le Sueur. Amid bold dynamic contrasts and unconventional progressions, the military dominates the orchestral exposition, though relief is temporarily provided (in a manner akin to Beethoven and Hummel) by reference to the lyrical second subject. Such a procedure had already been explored in the Second Concerto Symphonique (recorded on Hyperion CDA66889) and would unswervingly form the basis of his later concertos albeit with a greater sense of aplomb. The piano enters obliquely, as if embarking upon a cadenza, before orchestra and soloist launch into the second exposition. This phase of the work, the so-called second exposition, effectively expands the material already heard in the orchestral introduction, though now as part of a larger sonata-ritornello structure. The central orchestral ritornello takes us from the dominant, B flat, to the relative, C minor, marked by a closing cadence. This forms a platform for the development which begins with a veiled quotation from Beethoven’s Third Piano Concerto, a work Litolff greatly admired and which he frequently played on his European tours. Still in C minor, this yields to a nocturnal re-interpretation of the military idea, reminiscent of Field. A shift away from the relative is marked by the appearance of the lyrical secondary material, which, ever more frenetically for the soloist, moves towards the dominant. The recapitulation, very much understated (after the piano’s second cadenza), is signalled by the restatement of the second subject, first in the piano, and then by the orchestral tutti. This material essentially constitutes the much truncated reprise, for it is only in the spirited coda that Litolff chooses to restate the military music as a grand closing gesture. The scherzo, with its ubiquitous ‘tripping’ figures (created by the prolixity of acciaccaturas) and dialogue between soloist and orchestra, has all those familiar characteristics of the corresponding movement in the more famous Fourth Concerto. In the latter, Litolff adopted the more conventional ternary design, but in his Third Concerto the structure and tonal organisation are altogether more unconventional. The opening 97 bars of music in C minor, deftly orientated around the dominant, function as an extended preparation for the main focus of the movement, a full orchestral statement of a Dutch children’s song ‘Al is ons Prinsje nog zoo klein’. This tune then forms the basis of a fugal paragraph which also ends on the dominant, while a third section, marked ‘Presto’, attempts to restore C minor, only for the dominant to re-assert itself once again. This entire process is repeated wholesale, the final ‘Presto’ section this time used as a coda to establish C as the unequivocal tonic. The slow movement, in a simple ternary song form, features Litolff’s favoured sonorities of the cello and horn. The nocturnal mood, reminiscent once again of Field (though the harmonic world has the modernity of Chopin and Liszt), is disturbed briefly by an episode of tension and drama, but it soon gives way to a restatement of the main melody, more fully scored for the orchestra with decorative arpeggios and scalic passages in the piano. The finale has a lightness and vivacity like those scintillating closing movements in Mendelssohn’s concertos, where extreme agility is demanded not only in rapid passages of semiquavers, but also in spread tenths and double octaves. For the second subject Litolff introduced a second Dutch tune, ‘Wien Neerlands bloed’ (by Johann Wilhelm Wilms), which was widely sung in Belgium in 1830 during the successful uprising against the House of Orange. In fragmented form this anthem constitutes the bulk of the ensuing development and is strikingly recapitulated in B major in Litolff’s beloved lower strings. The recovery to E flat major, via its subdominant, is also executed with a Lisztian boldness, especially in the arresting orchestral transition that links this lyrical section to the athletic coda. Litolff’s Third Concerto enjoyed almost as much popularity as the Fourth in later years and was often performed not only by Litolff himself but by other aspiring virtuosi. The larger and more mature Concerto Symphonique No 5 in C minor Op 123, while well thought of, appears to have enjoyed less attention than its two forbears. This may be owing in part to the concerto’s considerable technical challenge in all four movements. It is also possible, however, that the more serious demeanour of the work appealed less to pianists and concert promoters than the Third and Fourth Concertos which had already become immensely popular over a period of twenty years or more beforehand. Yet in many ways the Fifth Concerto contains some of Litolff’s most interesting music. The scale of the work is also larger and more dramatic in gesture, the orchestral palette is more spacious (symptomatic of the developments in orchestral instruments of the later nineteenth century), and the harmonic palette more experimental. The structural processes of the first movement are much the same as practised in the earlier concertos—i.e. the classical organisation and delineation of soloist and orchestra remain intact—but it is in the nature and expression of the ideas that one detects a stylistic change. A new romanticism is evident in the brooding, almost Faustian darkness of the orchestral opening (which stretches to 132 bars compared with the 85 of the Third Concerto), and the influence of Liszt is plain to see in the richer harmonic vocabulary of the second subject (the initial dominant eleventh is a particular Lisztian thumbprint). There is also a broader contour to the melodic lines, and a greater confidence in the counter melodies invariably to be found in the tenor register of the cellos, both of which contribute to a greater sense of symphonic cohesiveness. The second movement, a scherzo in the Second, Third, and Fourth Concertos, is instead a slow movement of haunting beauty in E major, a ‘song without words’ dominated by the sumptuous, ‘vocal’ character of the cello and horn. The piano too has much splendid material as is borne out by the passionately Lisztian response to the opening orchestral statement (the sense of harmonic control, particularly in the recovery back to E major, is masterly) and the dramatic, not to say histrionic gestures of the central section. The scherzo, entitled ‘Intermède’, is a more demonic counterpart to its sister in the Fourth Concerto. With its angular sevenths, lean counterpoint, and sudden tonal shifts the movement has much in common with the Mephistophelian ethos of Liszt’s symphony and waltzes, though there is also that individual wry humour, colourful scoring (note especially the distinctive use of piccolo and triangle), and rhythmic vitality individual to Litolff’s extrovert personality. A foil to the sinewy texture is provided by a euphonious lilting theme suspended above the dominant of E flat, though this idea soon becomes infected with the idée fixe of the seventh interval. This may also be said of the unusual trio which begins in a becalmed manner with pizzicato strings and fragments of a pastoral bassoon solo, but is very quickly dispelled by further development of the scherzo material. The sonata rondo finale must be one of Litolff’s most bizarre and eccentric creations, yet it also embodies something of the composer’s latent originality. The classical rhetoric of the opening suggests that Litolff was once again looking back to Beethoven’s Third Concerto for his model, yet the overtly romantic second group of ideas, introduced by the piano, is finally balanced between a Mendelssohn Song without Words and a Lisztian ballade. Litolff’s recapitulatory process is also highly imaginative for in place of the conventional restatement of the first subject he inserts an extended cadenza of ferocious technical difficulty. Besides transforming the first subject, the cadenza, a full blown fugue, functions as a secondary development within the wider context of the movement’s sonata structure and is a logical outcome of the material’s fugal potential hinted at during the opening portion of the movement. The dynamic energy of the fugue looks back in part to Beethoven, but one suspects that it was Liszt’s use of fugue as a vehicle of modernity that inspired Litolff to write this extraordinary paragraph. For his part Liszt, who admired Litolff and his concertos immensely, dedicated his First Concerto (1849; revised 1853 and 1855) to his friend. It also seems likely that Litolff’s four-movement model played a part in the construction of Liszt’s work, since a scherzo (replete with Litolff’s much-loved triangle), features prominently at its centre. Peu de compositeurs du XIXe siècle peuvent se vanter d’avoir personnellement soulevé autant d’émois, d’intrigues et de drames qu’Henry Litolff. À l’image des grandes épopées romantiques de Hugo ou de Dumas, sa vie est une mosaïque de passions et de tourments ponctuée de mariages, de divorces et d’une existence nomade qui lui fit parcourir l’Europe entière. C’est du moins ce que rapportait le pianiste français Antoine Marmontel qui dans ses Virtuoses Contemporains (1882) décrivait avec animation un Litolff âgé de 64 ans souvent surnommé le «Liszt anglais». Selon lui, la physionomie intelligente et caractéristique de Litolff portait apparemment les signes des agitations et tempêtes morales qui avaient troublé son âme. Des cheveux argentés couronnaient son front proéminent et développé. Ses traits filiformes proche d’une pâle contenance étaient fins et distingués: mais en scrutant avec attention son visage original et caractéristique, on avait l’impression d’un vieillissement prématuré accéléré par les tempêtes de la vie. Les dangers inhabituels de la santé auquel tout grand artiste était alors exposé lui avaient laissé un tremblement nerveux. Pourtant, toute autre personne lancée dans une carrière aussi fulgurante que la sienne aurait certainement été réduite à néant. Aussi idyllique que dramatique, sa vie avait été une constante intrigue romanesque. Le père d’Henry, Martin Louis Litolff, était alsacien de naissance et combattit au sein de l’armée napoléonienne dans la péninsule ibérique lors de la campagne d’Espagne. Capturé par les forces victorieuses de Wellington, il fut emmené en Angleterre et libéré après le traité de paix. Une fois établi à Londres, Martin Litolff parvint tout juste à gagner sa vie comme violoniste de danse et épousa une Ecossaise du nom de Sophie Hayes. Ils eurent un fils unique Henry (Charles) Litolff. Ce fut son père qui assura l’éducation musicale du jeune enfant jusqu’à ses douze ans, quand ses dons devinrent par trop manifestes. À quatorze ans, le jeune Henry attirait l’attention d’Ignaz Moscheles. Ce dernier fut tellement impressionné par son talent qu’il lui proposa de lui donner des leçons—ce qu’il fit gratuitement jusqu’en 1835. Amoureux fou d’une jeune Anglaise, Elisabeth Etherington, Henry prit la fuite en sa compagnie pour Gretna Green afin d’échapper à l’opposition résolue de ses parents. Après leur mariage, le coupe s’envola vers la France et élut résidence à Melun, près de Paris. Dans la capitale française, Henry fit la connaissance de Pierre-Josef-Guillaume Zimmerman, du facteur de pianos Jean-Henri Pape et passa une grande partie de son temps à développer sa technique. Esprit agité, Litolff ne resta à Melun que peu de temps. Pape le présenta à Fétis qui engagea le jeune pianiste à se produire en soliste au Conservatoire de Bruxelles en 1839. Litolff y donna le Troisième Concerto pour piano de Beethoven et s’attira le parrainage du Duc de Looz qui l’invita dans sa propriété, près de Wavre. C’est là qu’il composa son premier Concerto Symphonique en ré mineur qui a été perdu. Durant cette période, il se sépara également de son épouse laquelle, le cœur mortifié, dut prendre le chemin du foyer familial en Angleterre. Selon Fétis, à Bruxelles Litolff se trouva mêlé à un scandale au point de devoir quitter les lieux précipitamment en 1841. On ne peut que spéculer sur la nature de l’affaire, probablement une histoire d’amour. Aidé par ses amis, il abandonna Bruxelles pour s’établir à Varsovie où, selon Fétis, il dirigea l’orchestre du Théâtre national. Cette période n’apporte guère de témoignages sur Litolff et d’aucuns ont suggéré qu’il ait souffert d’une longue dépression voire d’une insanité passagère. Sa réapparition sur la scène musicale fut marquée par les concerts qu’il donna au Gewandhaus de Leipzig et à Dresde en 1844, ainsi que par la première audition du Concerto Symphonique no2 opus 22. Sa présence, sa technique brillante, son style musical d’une grande excentricité impressionnèrent le jeune Hans von Bülow tant et si bien que toute sa famille lui offrit son amitié et l’aida à subvenir au cours de 1845. Outre les leçons qu’il donnait au jeune Hans, Litolff rencontra un immense succès lors de ses concerts à Prague et à Berlin. Jouissant d’une nouvelle renommée qui avoisinait celle de Chopin et Liszt, il retrouva peu à peu ses esprits, tout en subissant toujours les affres de sa situation matrimoniale irrésolue et de l’embarras public où elle le mettait. Ce fut un Litolff de nouveau miné qui retourna à Londres afin d’obtenir un divorce devant les tribunaux anglais. L’affaire n’était pas simple. Lors du procès, le juge requit qu’il vive avec sa femme ou paie la somme de 2000 livres. Incapable de s’acquitter du montant, déterminé à ne pas retourner auprès de son épouse, il fut jeté en prison où il demeura, misérable, pendant sept mois. Toujours plein de ressources, Litolff exploita l’amitié de la fille d’un des gardiens et s’enfuit à bord d’un coche vers la côte d’où il parvint à s’embarquer incognito (probablement grâce à un pot-de-vin) sur un bateau de pêche en direction de la Hollande. Il descendit clandestinement à terre, puis s’établit sur la place publique en tant que musicien respectable, enseignant et donnant des concerts à Utrecht et à Amsterdam. Ce fut là qu’il composa son Concerto Symphonique no3 en mi bémol majeur opus 45, véritable hommage au peuple hollandais. Afin de les remercier de l’asile bienveillant qu’ils lui avaient accordé, il incorpora à son œuvre deux vieilles chansons hollandaises. Entichés de Litolff, les journaux hollandais le qualifièrent de «Vieuxtemps du piano». Le public hollandais était tout autant épris de sa personne et les étudiants d’Utrecht allèrent jusqu’à écrire un poème en son honneur, le suppliant de ne pas les oublier. Litolff désirait pourtant aller de l’avant. Au cours de l’été 1847, il se refit une santé en Allemagne, dans le massif montagneux de Harz situé dans le Duché de Brunswick. Il se consacra à la composition de son premier opéra Die Braut von Kynast dont Fétis donna la première représentation à Bruxelles le 3 octobre 1847. Brunswick sembla lui porter chance. Il y fit la rencontre de Gottfried Meyer, un éditeur musical, et de sa femme, Julie, qui allait jouer un rôle crucial dans sa vie. En 1848, Litolff partit pour Vienne où il fut pris dans la tourmente de la Révolution de 1848. Embrassant le parti de la liberté, il composa une marche «dédiée fraternellement» à la Légion des étudiants dont il était membre. Imitant Wagner qui s’était enfui de Dresde, Litolff éluda le mandat d’arrêt prononcé à son encontre et quitta Vienne pour se réfugier à Brunswick avec les Meyers. En 1849, il devint citoyen du duché. S’il poursuivit ses voyages (un second séjour aux Pays-Bas et des concerts à Leipzig entre autres), sa santé mentale demeurait précaire. Des périodes dépressives et d’hypocondrie suivirent. En 1851, il obtint enfin le divorce de sa première femme et put épouser Julie Meyer veuve depuis 1849. Ce mariage permit à Litolff de reprendre la maison d’édition dont le nom devint «Henry Litolff’s Verlag». Sous sa direction, la firme fit paraître de nombreuses œuvres de maîtres dans des éditions bon marché et abordables. L’inventaire du catalogue comprend également des œuvres de son cru. Sous son impulsion, Brunswick connut une période d’épanouissement artistique grâce aux festivals qu’il mit sur pied où Anton Rubinstein, Liszt, Berlioz, Bülow et Moscheles firent partie des artistes invités. Après une période de silence créatif, dû probablement à son activité d’éditeur après son second mariage, Litolff se lança à nouveau sur la scène musicale. Une troisième tournée des Pays-Bas vit la composition de son Concerto Symphonique no4 opus 102, une œuvre qui y fut exécutée avec un immense succès tout comme en Belgique sous la direction de Fétis. Le Quatrième Concerto, comme le Troisième, se trouva être immensément populaire. Litolff fut porté par cette nouvelle vague d’admiration publique. Ses ouvertures Maximilien Robespierre opus 55 et Die Girondisten opus 80 (particulièrement admirée de Tchaïkovsky), furent également reçues avec chaleur, sans pour autant atteindre le succès du Quatrième Concerto dédié au Duc de Saxe-Coburg-Gotha. Le Duc devint le nouvel employeur de Litolff quoique la vie de Kapellmeister n’ait pu le satisfaire pendant bien longtemps. Il souffrait toujours de périodes de dépression, et négligeant sa seconde épouse, il obtint le divorce en 1858. Puis il partit pour Paris. Ce fut au cours d’un Concert des Jeunes Artistes du Conservatoire dirigé par Jules-Etienne Pasdeloup que Litolff connut un succès majeur avec son Quatrième Concerto. Dans le public se trouvait Berlioz qui décrivait ainsi l’événement: «le succès de Litolff a été tel, que le concert où on l’a entendu pour la première fois doit être consigné par la Société des Jeunes Artistes comme le jour le plus brillant de son existence.» Il poursuivait en rendant compte de la carrière de Litoff: «un compositeur de l’ordre le plus élevé. Il possède à la fois la science, l’inspiration et le bon sens. Une ardeur dévorante fait le fond de son caractère et l’entraînerait nécessairement à des violences et à des exagérations dont la beauté des productions musicales a toujours à souffrir …» Litolff partagea par la suite un concert parisien avec Berlioz où ses Concertos nos3 et 4 furent entendus aux côtés d’extraits de sa cantate Faust. Délaissant son foyer de Brunswick, Litolff trouva réconfort en la demeure campagnarde du Comte Wilfrid de la Rochefoucauld près de Fontainebleau. Il s’éprit de la fille du Comte, Louise, qu’il épousa en 1860. Peu d’informations transparaissent sur cette période de sa vie, mais il semble avoir trouvé une stabilité nouvelle et décidé de faire de Paris son lieu permanent de résidence. S’il poursuivit ses tournées de pianiste virtuose—durant la période 1864/5, il se rendit en Belgique et aux Pays-Bas tout en voyageant en Autriche, en Pologne et en Russie en 1867—il consacra plus de temps à la direction et à la composition, produisant plusieurs opéras et un oratorio. Il devint également un professeur de piano réputé. Entre 1867 et 1870, il devint le chef d’orchestre lyrique de l’Opéra de Paris où il organisa des concerts symphoniques imposants autour d’un répertoire de musique «moderne et ancienne», invitant les jeunes compositeurs à soumettre leurs nouvelles créations afin de les faire jouer. La fin de cette période, la dernière phase créatrice fertile de Litolff, fut marquée par la première de son Concerto Symphonique no5 en ut mineur opus 123 en février 1870. S’ensuit alors un déclin progressif. Ses opéras n’engendrèrent aucune réponse du public et ses concerts symphoniques se désintégrèrent peu à peu. Litolff se tourna alors vers la musique légère et l’opérette. Il présenta des festivals au Théâtre du Châtelet et dirigea des concerts de musique légère au fameux restaurant parisien de Frascati et aux cafés-concerts des Champs-Élysées. Trois ans après la disparition de sa troisième épouse (en 1873), il convola en justes noces pour la quatrième et dernière fois, avec la jeune fille de dix-sept ans qui lui avait permis de rétablir sa santé chancelante en 1875. Aux cours de dernières années de sa vie, il fut atteint de rhumatismes mais parvint à composer comme en témoigne la première de sa dernière œuvre lyrique d’envergure, son opéra Les Templiers, représentée à Bruxelles le 25 janvier 1886. Il s’éteignit le 5 août 1891, à l’âge de 73 ans, dans la ville de Bois-Colombes située près de Paris. Henri Litolff fut un des derniers grands pianistes compositeurs que le XIXe siècle ait comptés. S’il consacra la plus grande partie de son énergie créatrice à l’opéra après 1870, ses cinq concertos pour piano, ou Concertos Symphoniques tels qu’ils apparaissent sur la partition, ponctuent le cours de sa carrière professionnelle. Ces œuvres dévoilent aussi bien les impressionnantes capacités techniques du pianiste que l’éclectisme stylistique du compositeur qui possède à la manière de Janus une propension indéniable à épouser les formes et styles du concerto de nature plus classique de la première moitié du XIXe siècle (de Beethoven, Kalkbrenner, Moscheles et Chopin) tout en préfigurant l’audace harmonique, la richesse orchestrale et l’invention rythmique de la seconde moitié, en particulier de Liszt et Scharwenka. De plus, le style de Litolff partage avec celui de Berlioz une veine excentrique dans ses progressions harmoniques, l’emploi des timbres orchestraux et la conception structurelle qui séduit toujours par ses tours inattendus et sa manière de nous surprendre. Le titre générique distinct de Concerto Symphonique dérive essentiellement de l’ample structure en quatre mouvements privilégiée par Litolff (en place des trois habituels) conçue pour imiter la coupe symphonique où le scherzo joue un rôle crucial et (pour Litolff) caractéristique au sein de l’œuvre. Ses quatre concertos à avoir survécu ont également été décrits comme des symphonies concertantes où le piano aurait joué le rôle d’obbligato de l’orchestre. Cet argument est difficilement justifiable. Dans les premiers mouvements, Litolff se sert de l’orchestre pour introduire l’essentiel de son matériau thématique mais cette technique ne dérive en rien de l’introduction orchestrale conventionnelle ou ritornello du concerto classique de la fin du XVIIIe siècle et du début du XIXe, ni de la «double exposition» partagée entre soliste et orchestre. En outre, le rôle du solo et du ripieno est assuré d’une manière comparable à celle usuelle dans une situation ritornello-sonate de l’époque classique ou du début du Romantisme. Ce qui est confirmé par une simple comparaison avec les concertos de Beethoven, Chopin, Moscheles et Hummel. De plus, on perçoit aisément combien le piano est au cœur des trois autres mouvements (en particulier du scherzo) non seulement par l’importance du matériau thématique qui lui est octroyé, mais aussi par la nature même de ce matériau dont le caractère est déterminé par le tempérament et capacité techniques de l’instrument et du musicien. Litolff écrivit son Concerto symphonique no3 en mi bémol majeur opus 45 en 1846, alors qu’il résidait aux Pays-Bas. Sous-titrée «National Hollandais», cette œuvre s’illustre par son message de gratitude envers le peuple néerlandais en remerciement de la liberté retrouvée après avoir fui les geôles anglaises. L’œuvre distille donc un sens de liberté d’une importante toute personnelle pour le compositeur, mais communique aussi plus largement un message politique de liberté. Défenseur implicite des principes de la Révolution française de 1789, Litolff soutenait les idéaux de liberté et de démocratie pour l’homme sur les gouvernements monarchiques hégémoniques et despotiques (des idéaux qui lui valurent d’être pratiquement arrêté à Vienne en 1848), un sentiment qui transparaît particulièrement dans la confiance martiale du premier mouvement. De plus, le Concerto incorpore des chants hollandais qui servent à renforcer un sentiment patriotique au Pays-Bas tout comme en Belgique voisine qui venait de se libérer de la tutelle de Guillaume d’Orange en 1830. C’est par les sonorités martiales des vents et timbales que s’ouvre le premier mouvemente. Une telle idée aurait pu s’inspirer des opéras «révolutionnaires» de Méhul, Cherubini ou Le Sueur. Entre les audacieux contrastes de nuances et les progressions harmoniques sortant de l’ordinaire, le ton militaire prédomine au sein de l’exposition orchestrale même si un second thème lyrique parvient à glisser une accalmie passagère (à la manière de Beethoven et de Hummel). Un tel procédé avait déjà été exploré dans son Concerto symphonique no2 (disponible chez Hyperion CDA66889) et allait former immanquablement le fondement de ses concertos ultérieurs associé toutefois à un sens plus poussé de l’équilibre des forces en présence. Le piano entre indirectement, donnant l’impression de s’élancer dans une cadence, avant que l’orchestre et le soliste n’entament une deuxième exposition. Cette phase de l’œuvre, dénommée seconde exposition, amplifie un matériau énoncé auparavant lors de l’introduction orchestrale qui fait alors partie d’une structure sonate-ritornello élargie. La ritournelle orchestrale centrale nous entraîne de la dominante, si bémol, au relatif ut mineur, souligné par une cadence conclusive. Cette section ouvre la voie au développement qui débute par une citation voilée du Troisième Concerto pour piano de Beethoven, une œuvre que Litolff admirait profondément et qu’il jouait fréquemment lors de ses tournées d’Europe. Toujours en ut mineur apparaît alors une ré-interprétation nocturne de l’idée militaire qui n’est pas sans évoquer Field. L’éloignement du ton relatif est appuyé par l’apparition du matériau secondaire lyrique qui s’avance vers la dominante avec une frénésie croissante pour le soliste. La réexposition, nettement réduite (après la seconde cadence du piano), est soulignée par la reprise du second thème, d’abord au piano, puis par le tutti orchestral. Ce matériau constitue essentiellement une reprise abrégée, puisque ce n’est que dans la fougueuse coda que Litolff choisit de reprendre la musique militaire en un superbe élan final. Le scherzo, avec ses motifs omniprésents qui chancèlent (créés par la prolixité des acciacaturas) et son dialogue entre soliste et orchestre, possède tous les traits familiers du mouvement correspondant dans le fameux Quatrième Concerto. Pour celui-ci, Litolff adopta un motif ternaire plus conventionnel, mais au sein de ce Troisième Concerto, la structure et l’organisation tonale sortent largement de l’ordinaire. Adroitement orientées autour de la dominante, les 97 premières mesures de musique en ut mineur fonctionnent comme une vaste préparation pour le temps fort du mouvement, un énoncé orchestral complet de la comptine hollandaise «Al is ons Prinsje nog zoo klein». Cette comptine forme ensuite la base d’un paragraphe fugué qui conclut également à la dominante, tandis qu’une troisième section marquée «Presto» tente de restaurer ut mineur, seulement pour trouver une réaffirmation de la dominante, une fois de plus. Le procédé est entièrement repris, la section finale «Presto» se servant cette fois d’une coda pour établir sans équivoque ut pour tonique. Le mouvement lent, une simple mélodie ternaire, dévoile les sonorités préférées de Litolff pour le piano et le cor. L’atmosphère nocturne évoque Field une fois de plus (même si l’univers harmonique possède la modernité de Chopin et Liszt). Elle est brièvement troublée par un épisode de tension et de drame qui laisse cependant place à une reprise de la mélodie principale plus pleinement orchestrée secondée par les arpèges et traits décoratifs au piano. Le finale possède la légèreté et la vivacité des mouvements conclusifs scintillants des concertos de Mendelssohn où une agilité extrême est requise non seulement dans les passages rapides de doubles croches mais aussi les jeux de dixièmes et doubles octaves. Comme second élément thématique, Litolff introduit une autre mélodie hollandaise, «Wien Neerlands bloed» (de Johann Wilhelm Wilms) qui était largement chantée en Belgique en 1830 durant la révolte victorieuse contre la maison d’Orange. Sous une forme fragmentée, cet hymne constitue le corps du développement qui suit, et est repris de manière étonnante en si bémol majeur par les chères cordes graves de Litolff. La reprise de mi bémol majeur à travers la sus-dominante est également exécutée avec uneÿaudace lisztienne, en particulier dans la transition orchestrale saisissante qui associe la section lyrique et la coda athlétique. Souvent interprété par Litolff mais aussi par d’autres aspirants virtuoses, le Troisième Concerto de Litolff s’illustra par une popularité presque comparable à celle du Quatrième, conçu quatre ans plus tard. D’une ampleur et d’une maturité plus grandes, le Concerto Symphonique no5 en ut mineur opus 123 semble avoir été moins prisé que les deux précédents tout en jouissant de l’estime générale. Ceci est peut-être dû aux exigences techniques considérables appelées par les quatre mouvements. Il est également possible que l’allure plus sérieuse de l’œuvre ait été moins séduisante pour les pianistes et promoteurs que les Troisième et Quatrième Concertos qui avaient eu l’occasion d’atteindre une immense popularité au cours de leur vingtaine d’années d’existence. Par bien des égards, le Concerto no5 recèle les pages les plus intéressantes de Litolff. L’envergure de l’œuvre est plus vaste, plus dramatique. La palette orchestrale est plus spacieuse (symptomatique des développements de la facture instrumentale à la fin du XIXe siècle) et la gamme harmonique est plus expérimentale. Les procédés structurels du premier mouvement reprennent ceux des concertos précédents—l’organisation classique et la délinéation soliste-orchestre demeurent similaires—mais c’est dans la nature et l’expression des idées qu’apparaît un changement stylistique. Un romantisme nouveau est d’emblée perceptible avec l’obscurité inquiétante et quasiment faustienne de l’introduction orchestrale (qui comprend 132 mesures en place des 85 du Troisième Concerto), et l’influence de Liszt est tangible dans l’enrichissement du vocabulaire harmonique du second thème (la onzième de dominante initiale constituant un trait lisztien caractéristique). Les lignes mélodiques épousent des contours plus amples tandis que les contre-mélodies dénotent une assurance plus grande, en particulier dans les registres ténors des violoncelles. Ces deux éléments contribuent à assurer un sens plus affirmé de cohésion symphonique. Contrairement aux Deuxième, Troisième et Quatrième Concertos, le second mouvement n’est pas un scherzo mais un mouvement lent en mi majeur d’une beauté lancinante, une «romance sans paroles» dominée par le caractère «vocal» du violoncelle et du cor. Le piano possède également un matériau splendide semblant né d’une réponse passionnément lisztienne à l’introduction orchestrale (le sens du contrôle harmonique, en particulier dans le retour vers mi majeur, est magistral) et des gestes dramatiques pour ne pas dire histrioniques de la section centrale. Intitulé «Intermède», le scherzo offre une contrepartie nettement plus démoniaque au mouvement comparable du Concerto no4. Avec ses septièmes angulaires, son contrepoint ascétique et ses brusques changements tonals, ce mouvement reprend par bien des égards l’ethos méphistophélique des symphonies et valses de Liszt. On y trouve cependant l’humour ironique, la partition colorée (à noter en particulier l’emploi du piccolo et du triangle) et la vitalité rythmique individuelle de la personnalité extravertie de Litolff. La texture musclée se drape d’un thème euphonique animé suspendu sur la dominante de mi bémol, même si ce motif est rapidement contaminé par l’idée fixe de l’intervalle de septième. On pourrait également parler du trio inhabituel en des termes similaires puisqu’il débute de manière encalminée avec des cordes en pizzicatos et des fragments d’un solo pastoral au basson mais qui se dissout rapidement face au développement du matériau du scherzo. Le finale de coupe rondo-sonate est une des créations des plus bizarres et excentriques de Litolff tout en incarnant quelque chose de l’originalité latente du compositeur. La rhétorique classique du début laisse à penser que Litolff se soit à nouveau inspiré du Troisième Concerto de Beethoven. Pourtant le second groupe thématique romantique à l’excès énoncé au piano est finalement équilibré par une Romance sans paroles mendelssohnienne et une ballade lisztienne. La technique de réexposition est particulièrement originale, car au lieu de reprendre conventionnellement le premier thème, Litolff incorpore une ample cadence d’une difficulté technique féroce. Outre la transformation du premier thème, la cadence qui est en réalité une fugue complète, fonctionne comme développement secondaire au sein du contexte élargi de la coupe sonate du mouvement. Elle constitue une conclusion logique au potentiel fugué que le matériau dissimulait durant la première portion du mouvement. L’énergie dynamique de la fugue évoque parfois Beethoven mais on peut supposer que c’est l’emploi lisztien de la fugue en tant qu’outil de modernité qui a éveillé chez Litolff l’inspiration d’un paragraphe tellement extraordinaire. Liszt, quant à lui, admirait Litolff et ses concertos avec ferveur et dédia à son ami son Premier Concerto (1849, révisé en 1853 et 1855). Il est probable que le modèle en quatre mouvements de Litolff a joué un rôle considérable dans l’élaboration de l’œuvre de Liszt, puisqu’un scherzo (au complet avec le triangle que Litolff aimait tant) trône en bonne place en son centre. Die intelligente und markante Physiognomie Litolffs trägt eindeutig den Stempel der Aufregungen und moralischen Unbilden, die seiner Seele zugesetzt haben. Silbernes Haar krönt eine stark hervortretende Stirn. Die hageren Linien seines blassen Gesichts sind fein und kultiviert; doch wenn man seine originellen, charakteristischen Gesichtszüge aufmerksam betrachtet, hat man den Eindruck verfrühterAlterung, die durch die Stürme des Lebens beschleunigt wurde. Die ungewöhnlichen gesundheitlichen Risiken, denen ein großer Künstler ausgesetzt ist, haben ihm einen nervösen Tremor eingetragen. Dennoch ist es so, daß eine derart steile Karriere so gut wie jeden anderen außer ihm überfordert hätte. Sein Leben war so sehr ein Idyll, ein Drama, und hatte immer etwas von einem Roman voller Intrigen. Litolffs Vater Martin Louis Litolff stammte aus dem Elsaß und war während Napoleons Spanienfeldzug Soldat in dessen Heer. Nachdem ihn Wellingtons siegreiches Heer gefangengenommen hatte, wurde er nach England gebracht und nach Inkrafttreten des Waffenstillstands freigelassen. Martin Litolff ließ sich in London nieder, verdiente notdürftig seinen Lebensunterhalt als Tanzgeiger und heiratete eine Schottin namens Sophie Hayes. Henry (Charles) Litolff war der einzige Sohn der beiden. Sein Vater übernahm seine Musikausbildung, bis er zwölf Jahre alt war und die Begabung des Jungen längst unübersehbar war. Mit vierzehn fiel er Ignaz Moscheles auf, der von seinem Talent so beeindruckt war, daß er sich erbot, ihm Unterricht zu erteilen. Die Stunden bei Moscheles (der auf ein Honorar großzügig verzichtete) setzen sich bis 1835 fort. Dann verliebte sich Henry unsterblich in Elisabeth Etherington, eine junge Engländerin, und brannte mit ihr nach Gretna Green durch, um dem entschlossenen Widerstand seiner Eltern zu entgehen. Im Anschluß an die Hochzeit floh das Paar nach Frankreich und richtete sich einem Dorf namens Melun bei Paris häuslich ein. In der französischen Hauptstadt lernte Henry Pierre-Josef-Guillaume Zimmermann und den Klavierbauer Jean-Henri Pape kennen und verwandte viel Zeit darauf, seine Klaviertechnik zu verbessern. Litolff, ein rastloser Geist, blieb nicht lange in Melun. Pape machte ihn mit François-Joseph Fétis bekannt, der den jungen Pianisten für ein Konzert am Brüsseler Konservatorium im Jahr 1839 engagierte. Litolff spielte mit großem Erfolg Beethovens Drittes Klavierkonzert und fand im Duc de Looz einen Gönner, der ihn auf seinen Landsitzt bei Wavre einlud. Dort komponierte Litolff sein erstes Sinfonisches Konzert in d-Moll, das seither verlorengegangen ist. Um diese Zeit trennte er sich außerdem von seiner Frau, die reuig zu ihrer Familie nach England zurückkehrte. Fétis zufolge wurde Litolff in Brüssel in einen Skandal verwickelt, dem er sich 1841 recht hastig entziehen mußte. Was das für ein Skandal war, können wir nur vermuten, aber vermutlich ging es um eine irgendwie geartete Liebesaffäre. Mit Unterstützung seiner Freunde ließ er Brüssel weit hinter sich, indem er nach Warschau umzog, wo er laut Fétis Dirigent des Nationaltheater-Orchesters wurde. In diesem Zeitraum ist von Litolff kaum etwas bekannt, aber man munkelt, daß dies entweder auf eine länger anhaltende Depression oder sogar vorübergehende geistige Umnachtung zurückzuführen war. Seine erneutes Erscheinen auf der musikalischen Szene war gekennzeichnet von Konzerten, die er 1844 im Leipziger Gewandhaus und in Dresden gab, sowie von der ersten Darbietung seines Sinfonischen Konzerts Nr. 2 op. 22. Seine Präsenz, seine brillante Technik und sein exzentrischer musikalischer Stil beeindruckten den jungen Hans von Bülow, dessen Familie sich mit Litolff anfreundete und ihn im Lauf des Jahres 1845 finanziell unterstützte. Damals unterrichtete er nicht nur Bülow, sondern gab auch erfolgreiche Konzerte in Prag und Berlin. Sein neuer Ruhm, der an den von Chopin und Liszt heranreichte, ließ ihn wieder Mut fassen, doch sein eheliches Dilemma und die Verlegenheit, in das es ihn in der Öffentlichkeit brachte, machten ihm dennoch zu schaffen. Als Litolff erneut erkrankte, kehrte er nach London zurück, um vor den englischen Gerichten die Scheidung von seiner Frau zu erwirken. Sie erwies sich als verzwickte Sache, und bei der Verhandlung befahl ihm der Richter, entweder mit seiner Frau zusammenzuleben oder ihr zweitausend Pfund Sterling auszuzahlen. Da er nicht in der Lage war, zu zahlen, und nicht bereit, die erste Alternative zu wählen, wurde er in den Schuldturm geworfen, wo er monatelang im Elend festsaß. Da er sich immer zu helfen wußte, nutzte er die Freundschaft mit der Tochter des Gefängniswärters und setzte sich in einem Bauerngespann ab an die Küste, wo es ihm (wohl mit Hilfe eines angemessen hohen Bestechungsgeldes) gelang, sich unerkannt auf einem Fischerboot nach Holland einzuschiffen. Nachdem er sich von Bord geschlichen hatte, schaffte er es, sich als ehrbarer Musiker einzuführen, lehrte und gab Konzerte in Utrecht und Amsterdam. Dort komponierte er sein Sinfonisches Konzert Nr. 3 in Es-Dur op. 45, in das als Huldigung an das niederländische Volk und zum Dank für seine sichere Zuflucht zwei alte niederländische Weisen eingearbeitet sind. Die niederländischen Zeitungen, die sehr von Litolff angetan waren, nannten ihn den „Vieuxtemps des Klaviers“. Das niederländische Publikum war ähnlich vernarrt in ihn, und die Studenten von Utrecht schrieben gar ihm zu Ehren ein Gedicht, in dem sie ihn baten, sie nicht zu vergessen. Litolff jedoch war erpicht darauf, weiterzuziehen. Im Sommer 1847 reiste er zu einem Genesungsaufenthalt in den Harz im damaligen Herzogtum Braunschweig und komponierte Die Braut von Kynast, seine erste Oper, die am 3. Oktober 1847 unter der Leitung von Fétis in Brüssel uraufgeführt wurde. Litolff empfand Braunschweig als angenehm; er machte die Bekanntschaft von Gottfried Meyer, dem Musikverleger, und dessen Gemahlin Julie, die in seinem künftigen Leben eine wichtige Rolle spielen sollte. Im Jahr darauf ging er nach Wien, wo er in die Revolution von 1848 verwickelt wurde. Als Verfechter der Sache der Freiheit komponierte er einen Marsch und widmete ihn in brüderlicher Hingabe der Studentenlegion, in der er Mitglied war. Wie Wagner aus Dresden floh Litolff aus Wien, als man einen Haftbefehl gegen ihn erließ. Er suchte Zuflucht in Braunschweig bei den Eheleuten Meyer, und 1849 wurde ihm dort das Bürgerrecht gewährt. Obwohl er weiterhin herumreiste (er stattete Holland einen zweiten Besuch ab und gab Konzerte in Leipzig), war er geistig nicht stabil, und es folgten weitere Phasen der Depression und Hypochondrie. 1851 trat die Scheidung von seiner ersten Frau endlich in Kraft, und er heiratete Julie Meyer, deren Mann 1849 gestorben war. Dadurch konnte Litolff den Betrieb des Verlages übernehmen, dessen Name in „Henry Litolff’s Verlag“ geändert wurde. Unter Litolffs Leitung brachte das Unternehmen viele Meisterwerke in einfachen, erschwinglichen Ausgaben heraus, und zur Liste der verlegten Werke zählten auch seine eigenen. Braunschweig erlebte außerdem eine Zeit der künstlerischen Bereicherung, denn Litolff veranstaltete eine Reihe von Festspielen, bei denen unter anderem Anton Rubinstein, Liszt, Berlioz, Bülow und Moscheles zugegen waren. Nach einer Phase kreativen Schweigens, die wohl überwiegend auf seine verlegerische Tätigkeit im Anschluß an seine zweite Eheschließung zurückzuführen war, nahm Litolff von neuem seine Konzertkarriere auf. Während einer dritten Tournee in den Niederlanden entstand sein Sinfonisches Konzert Nr. 4 op. 102, das dort und unter Fétis’ Leitung in Belgien mit großem Erfolg aufgeführt wurde. Das Vierte Konzert und die Wiederaufnahme des Dritten erwiesen sich als ungeheuer populär, und Litolff wurde von dieser neuen Woge öffentlichen Ansehens mitgerissen. Seine Ouvertüren Maximilian Robespierre op. 55 und Die Girondisten op. 80 (ein von Tschaikowski sehr bewundertes Stück) kamen ebenfalls gut an, doch mit der Zustimmung für das Vierte Konzert, das dem Herzog von Sachsen-Coburg-Gotha gewidmet war, konnte es kein anderes Werk aufnehmen. Der Herzog wurde Litolffs neuer Dienstherr, doch das Leben eines Kapellmeister stellte den Pianisten nicht lange zufrieden. Anfälle von Depression plagten ihn weiter, und die Vernachlässigung seiner zweiten Frau führte 1858 zur Scheidung, woraufhin Litolff nach Paris zog. Bei einem Concert des jeunes artistes du conservatoire unter der Leitung von Jules-Etienne Pasdeloup in Paris erzielte Litolff mit dem Vierten Konzert einen beachtlichen Erfolg. Ein Besucher des Konzerts war Berlioz, der den Anlaß als „den glanzvollsten Tag in der Geschichte der Société des Jeunes Artistes“ bezeichnete und dann von Litolffs Werdegang berichtete. Litolff, fuhr Berlioz fort, sei „ein Komponist von höchstem Rang. Er hat zugleich Sachverstand, Inspiration und gesunden Menschenverstand. Doch am Grunde seines Charakters liegt eine alles verschlingende Inbrunst, und sie verleitet ihn zwangsläufig zu Gewaltakten und Übertreibungen, unter denen die Schönheit seiner musikalischen Schöpfungen immer gelitten haben …“ Später gab Litolff gemeinsam mit Berlioz ein Konzert in Paris, auf dessen Programm sowohl sein Drittes und Viertes Konzert als auch Auszüge aus seiner Faust-Kantate standen. Nachdem er seinen Braunschweiger Wohnsitz aufgegeben hatte, fand Litolff Trost auf dem Landsitz des Grafen Wilfrid de la Rochfoucauld bei Fontainebleau. Er verliebte sich in Louise, die Tochter des Grafen, und heiratete sie im Jahr 1860. Über diese Periode im Leben Litolffs ist kaum etwas bekannt, doch hat es den Anschein, daß er darin neue Stabilität fand und beschloß, auf Dauer in Paris ansässig zu werden. Obwohl er weiterhin als Klaviervirtuose in Europa unterwegs war—im Zeitraum 1864/65 besuchte er Belgien und Holland und reiste 1867 nach Österreich, Polen und Rußland—, widmete er dem Dirigieren und der Komposition mehrerer Opern und eines Oratoriums mehr Zeit. Außerdem wurde er als Klavierlehrer wohlbekannt. Zwischen 1867 und 1870 war er Dirigent an der Pariser Opéra und organisierte groß angelegte Konzerte „moderner und alter“ Orchestermusik; junge Komponisten waren aufgefordert, für diese Konzerte zur Begutachtung und Aufführung neue Werke einzureichen. Den Abschluß dieser Periode, der letzten Phase fruchtbarer Kreativität für Litolff, bildete die Uraufführung seines Sinfonischen Konzerts Nr. 5 in c-Moll op. 123 im Februar 1870. Danach setzte allmählich der Verfall ein. Seine Opern beeindruckten das Publikum nicht, und seine Orchesterkonzerte verloren den inneren Zusammenhalt. Er wandte sich stattdessen der leichten Musik und der Operette zu, veranstaltete Festspiele am Théâtre du Châtelet und dirigierte Konzerte mit leichter Musik in Frascatis berühmtem Pariser Restaurant und in einem Café concert auf den Champs-Elysées. Drei Jahre nach dem Tod seiner dritten Frau (im Jahr 1873) heiratete er zum vierten und letzten Mal, ein siebzehnjähriges Mädchen, das ihn 1875 gesundgepflegt hatte. In den letzten Jahren seines Lebens war er von Rheumatismus geplagt, fand aber immer noch Zeit zum Komponieren. Das beweist die Uraufführung seines letzten bedeutenden Werks, der Oper Les Templiers, am 25. Januar 1886 in Brüssel. Er starb am 5. August 1891 mit dreiundsiebzig Jahren in Bois-Colombes bei Paris. Henry Litolff war einer der letzten großen Klavierkomponisten und -virtuosen des neunzehnten Jahrhunderts. Obwohl die Oper nach 1870 viel von seiner Zeit in Anspruch nahm, waren es seine fünf Konzerte (unter der Bezeichnung Concertos Symphoniques herausgegeben), die im wesentlichen Teil seiner Karriere als Berufsmusiker die Akzente setzen. Diese Werke sagen uns viel über die eindrucksvolle technische Fertigkeit Litolffs als Pianist, liefern aber vor allem Belege für Litolffs stilistische Eklektik. Diese Eklektik ist janusköpfig, neigt sie doch dazu, auf die eher an der Klassik orientierten Konzertstile der ersten Hälfte des neunzehnten Jahrhunderts zurückzublicken (auf Beethoven, Kalkbrenner, Moscheles und Chopin), während ihre kühne Harmonik, üppige Orchestrierung und rhythmische Ideenfülle zugleich auf die zweite Hälfte, insbesondere auf Liszt und Scharwenka vorausblicken. Mit Berlioz hat Litolffs Stil außerdem eine gewisse Exzentrik hinsichtlich der harmonischen Fortschreitungen gemeinsam, der Nutzung von Orchesterklangfarben und der strukturellen Gestaltung, die mit ihrer Unberechenbarkeit und Fähigkeit, zu überraschen, immer wieder besticht. Der unverwechselbare Oberbegriff Concerto symphonique bezieht sich im wesentlichen auf Litolffs Grundschema aus vier Sätzen (anstelle der herkömmlichen drei), dazu gedacht, die viersätzige Anlage der Sinfonie nachzuahmen, in der das Scherzo eine bedeutsame und (für Litolff) höchst charakteristische Rolle spielt. Die vier erhaltenen Konzerte Litolffs sind auch als symphonies concertantes bezeichnet worden, in denen das Klavier gegenüber dem Orchester angeblich die Funktion des Obligatoinstruments übernimmt. Dieses Argument, so scheint es, ist schwerer zu rechtfertigen. In seinen ersten Sätzen benutzt Litolff das Orchester dafür, all sein wesentliches Themenmaterial darzulegen, doch das bedeutet keine Abweichung von der konventiollen Orchestereinleitung bzw. vom Ritornell des typischen Konzerts im späten achtzehnten oder frühen neunzehnten Jahrhundert, auch nicht von der sogenannten „doppelten Exposition“, die von Solist und Orchester getragen wird. Genauer gesagt: Die Rolle von Solo und Ripieno ist weitgehend so umgesetzt, wie man es bei einer verschmolzenen Ritornell-Sonate der Klassik oder Frühromantik erwarten würde. Der Vergleich mit den Konzerten von Beethoven, Chopin, Moscheles und Hummel bestätigt es. Außerdem würde man sich schwer tun, das Klavier nicht als zentral für die übrigen drei Sätze (speziell das Scherzo) zu betrachten. Das liegt nicht nur am schieren Gewicht des Materials, das ihm übertragen wird, sondern auch am Wesen des Materials, dessen Charakter durch die technischen Voraussetzungen und Möglichkeiten des Instruments und des Interpreten bestimmt wird. Litolffs Concerto symphonique Nr. 3 in Es-Dur op. 45 stammt aus dem Jahr 1846, das er in Holland verlebte. Der Untertitel „Concert national Hollandais“ bekundet seinen Dank an das niederländische Volk für die Freiheit, die er nach seiner Flucht aus dem Gefängnis in England genoß. Darum haftet dem Werk ein Gefühl der Libertät an, das für den Komponisten von persönlicher Bedeutung war, vermittelt aber auch umfassendere politische Aussagen zum Thema Freiheit. Litolff, der unbedingt an die Prinzipien der Französischen Revolution von 1789 glaubte, hatte hohe Ideale von menschlicher Freiheit und Demokratie und lehnte die Hegemonie despotisch monarchischer Regierungssysteme ab (Ideale, die 1848 in Wien fast zu seiner Festnahme geführt hätten), und diese Gesinnung wird in der martialischen Zuversicht des ersten Satzes besonders deutlich. Darüber hinaus dient die Verwendung niederländischer Weisen im Konzert dazu, das Nationalbewußtsein nicht nur in Holland zu stärken, sondern auch im benachbarten Belgien, das sich 1830 von der Herrschaft des Hauses Oranien befreit hatte. Der Klang eines Bläseremsembles samt Pauken läßt den ersten Satz in militärischer Stimmung beginnen. Eine solche Idee hätte einer „revolutionären“ Oper von Méhul, Cherubini oder Le Sueur entspringen können. Inmitten kühner dynamischer Kontraste und unkonventioneller Fortschreitungen beherrscht das Militärische die Orchesterexposition, auch wenn das Engreifen des lyrischen Seitenthemas (auf eine Art, die an Beethoven und Hummel erinnert) vorübergehend für Entspannung sorgt. Dieses Vorgehen war bereits im Zweiten Concerto symphonique erprobt worden (eingespielt auf Hyperion CDA66889) und sollte unbeirrt und mit noch größerer Sicherheit die Grundlage seiner späteren Konzerte bilden. Das Klavier setzt wie nebenbei ein, wie um eine Kadenz anzustimmen, ehe Orchester und Solist die zweite Exposition beginnen. Diese Phase des Werks führt effektiv jenes Material weiter aus, das in der Orchestereinleitung zu hören war, nun jedoch als Teil einer umfassenderen Sonaten-Ritornell-Struktur. Das zentrale Orchesterritornell bringt uns, gekennzeichnet durch eine Schlußkadenz, von der Dominante B zur Paralleltonart c-Moll. Sie bildete die Grundlage für die Durchführung, die mit einem versteckten Zitat aus Beethovens Drittem Klavierkonzert anfängt, einem Werk, das Litolff sehr bewunderte und das er auf seinen Europatourneen häufig spielte. Nach wie vor in c-Moll schließt eine Neuinterpretation der militärischen Idee im Nocturne-Stil an, die an John Field denken läßt. Die Abkehr von der Paralleltonart ist dadurch gekennzeichnet, daß das Materials des lyrischen Seitenthemas auftaucht und in für den Solisten immer rasenderem Tempo der Dominante entgegenstrebt. Die Reprise, die (nach der zweiten Kadenz des Klaviers) sehr zurückhaltend klingt, wird angekündigt durch die erneute Darbietung des zweiten Themas, erst vom Klavier, dann vom gesamten Orchester. Dieses Material stellt im wesentlichen die stark gestutzte Reprise dar, denn erst in der schwungvollen Coda läßt Litolff als grandiose Schlußgeste noch einmal die Militärmusik erklingen. Das Scherzo mit seinen allgegenwärtigen „Trippelfiguren“ (erzeugt durch häufige Acciaccaturas) und seinem Dialog zwischen Solist und Orchester verfügt über alle Merkmale, die vom entsprechenden Satz des bekannteren Vierten Konzerts her vertraut sind. Dort hat Litolff die herkömmlichere dreiteilige Form gewählt, während im Dritten Konzert Aufbau und die tonale Ordnung insgesamt unkonventioneller sind. Die ersten 97 Takte Musik in c-Moll, geschickt um die Dominante herum angesiedelt, fungieren als ausgedehnte Vorbereitung auf die zentrale Aussage des Satzes, eine Darbietung des niederländischen Kinderliedes „Al is ons Prinsje nog zoo klein“ durch das gesamte Orchester. Diese Weise dient sodann als Grundlage einer fugalen Passage, die ebenfalls auf der Dominante endet, während ein dritter Abschnitt mit der Bezeichnung „Presto“ c-Moll wiederherzustellen versucht—doch die Dominante setzt sich erneut durch. Dieser ganze Prozeß wird pauschal wiederholt, nur daß die abschließende „Presto“-Passage diesmal als Coda eingesetzt wird, um C eindeutig als Tonika zu etablieren. Der langsame Satz in schlichter dreiteiliger Liedform gibt Litolffs Lieblingsklängen den Vorrang, denen von Cello und Horn. Die nächtliche Stimmung, die wiederum an Fields Nocturnes erinnert (auch wenn ihre Harmonik die Modernität von Chopin und Liszt besitzt), wird kurz von einer Episode voller Spannung und Dramatik gestört, doch die macht bald einer Wiederholung der Hauptmelodie Platz, die in vollerer Orchesterbesetzung und mit dekorativen Arpeggien und Tonleiterpassagen auf dem Klavier erklingt. Das Finale hat eine Leichtigkeit und Lebhaftigkeit ähnlich den geistsprühenden Schlußmomenten der Konzerte von Mendelssohn, wo extreme Fingerfertigkeit nicht nur für schnelle Sechzehntelpassagen, sondern auch für Dezimen und Doppeloktaven in weiter Lage gefordert wird. Als zweites Thema hat Litolff „Wien Neerlands bloed“ (von Johann Wilhelm Wilms) verwendet, eine weitere niederländische Weise, die 1830 in Belgien während der erfolgreichen Erhebung gegen das Haus Oranien häufig gesungen wurde. In ihre Einzelteile zerlegt findet diese Hymne Verwendung als Hauptmaterial der anschließenden Durchführung und wird in H-Dur von Litolffs geliebten tiefen Streichern eindrucksvoll rekapituliert. Die Rückkehr nach Es-Dur auf dem Umweg über die Subdominante ist mit Lisztscher Kühnheit ausgeführt, erkennbar vor allem in der faszinierenden Orchesterüberleitung, die diesen lyrischen Abschnitt mit der kraftvollen Coda verbindet. Litolffs Drittes Konzert war fast so populär wie später das Vierte und wurde nicht nur von Litolff selbst, sondern auch von anderen aufstrebenden Virtuosen häufig aufgeführt. Das umfangreichere und reifere Concerto symphonique Nr. 5 in c-Moll op. 123 wurde zwar geschätzt, scheint aber weniger Aufmerksamkeit erregt zu haben als seine beiden Vorgänger. Das könnte zum Teil auf die erheblichen technischen Anforderungen zurückzuführen sein, die das Konzert in allen vier Sätzen stellt. Ebenso möglich wäre, daß das ernsthafte Gebaren des Werks Pianisten und Konzertveranstaltern weniger zusagte als das Dritte und Vierte Konzert, die schon zwanzig Jahre oder noch länger davor ungeheure Beliebtheit erlangt hatten. Dabei enthält das Fünfte Konzert in vielerlei Hinsicht die interessanteste Musik Litolffs. Das Werk ist außerdem größer angelegt und in seiner Gestik dramatischer, die klangfarbliche Palette breiter (ein Symptom für die Weiterentwicklung, die Orchesterinstrumente im späteren neunzehnten Jahrhundert erfahren haben), die harmonische Palette experimenteller. Die strukturgebenden Prozesse des ersten Satzes sind im wesentlichen die gleichen, wie sie in den früheren Konzerten angewandt wurden—d.h. die klassische Anordnung und Abgrenzung von Solist und Orchester bleiben wie gehabt—, doch im Charakter und Ausdruck der Ideen ist eine stilistische Änderung zu entdecken. Eine neue Romantik macht sich in der grüblerischen, beinahe faustischen Düsterkeit der Orchestereinleitung bemerkbar (die sich über 132 Takte erstreckt, verglichen mit 85 im Dritten Konzert), und der Einfluß von Liszt ist im gehaltvolleren harmonischen Vokabular des zweiten Themas deutlich zu erkennen (die dominante Undezime am Anfang ist ein besonderes Lisztsches Charakteristikum). Außerdem sind die Konturen der Melodielinien breiter gefaßt, und die Gegenmelodien, die ausnahmslos im Tenorregister der Celli angesiedelt sind, wirken selbstbewußter, was beides zu einem gesteigerten Eindruck sinfonischen Zusammenhalts beiträgt. Der zweite Satz, im Zweiten, Dritten und Vierten Konzert jeweils ein Scherzo, ist hier stattdessen ein betörend schöner langsamer Satz in E-Dur, ein „Lied ohne Worte“, das vom üppig „sanglichen“ Charakter von Cello und Horn dominiert wird. Auch dem Klavier ist viel prachtvolles Material zugedacht, wie die leidenschaftlich Lisztsche Reaktion auf die einleitende Aussage des Orchesters (die harmonische Kontrolle, vor allem in der Rückführung nach E-Dur, ist meisterhaft) und die dramatischen, um nicht zu sagen theatralischen Gesten des Mittelteils beweisen. Das „Intermède“ betitelte Scherzo ist ein dämonischeres Gegenstück zum entsprechenden Abschnitt des Vierten Konzerts. Mit seinen kantigen Septimen, dem verschlankten Kontrapunkt und den jähen tonalen Verlagerungen hat der Satz viele Gemeinsamkeiten mit dem mephistophelischen Ethos der Sinfonie und der Walzer von Liszt, doch finden sich darin auch der feine individuelle Humor, die abwechslungsreiche Instrumentierung (man beachte speziell den unverwechselbaren Einsatz von Pikkoloflöte und Triangel) und die rhythmische Vitalität, die eine Besonderheit von Litolffs extrovertierter Persönlichkeit waren. Für Kontrast zu diesem robusten Gefüge sorgt ein wohlklingendes liedhaftes Thema, das über der Dominante Es-Dur schwebt, doch dieses Motiv wird bald mit der Idée fixe der Septime infiziert. Das gleiche ließe sich von dem ungewöhnlichen Trio sagen, das in besänftigter Manier mit Pizzicatostreichern und Fragmenten eines pastoralen Fagottsolos einsetzt, jedoch rasch durch die fortgesetzte Verarbeitung des Scherzomaterials vertrieben wird. Das Finale, ein Sonatenrondo, ist wohl eine der bizarrsten, exzentrischsten Schöpfungen Litolffs, offenbart aber auch etwas von der latenten Originalität des Komponisten. Die klassische Rhetorik der Eröffnung deutet darauf hin, daß sich Litolff wiederum Beethovens Drittes Konzert zum Vorbild genommen hat, doch die unverhohlen romantische zweite Themengruppe, die vom Klavier eingeführt wird, stellt am Ende doch einen Balanceakt zwischen einem Mendelssohnschen Lied ohne Worte und einer Lisztschen Ballade dar. Litolffs Rekapitulationsprozeß ist ebenfalls höchst einfallsreich, denn anstelle der herkömmlichen Wiederholung des Hauptthemas bezieht er eine längere Kadenz von furchterregender technischer Schwierigkeit ein. Diese Kadenz, eine ausgewachsene Fuge, verwandelt nicht nur das erste Thema, sondern fungiert auch als untergeordnete Durchführung im größeren Zusammenhang der Sonatenstruktur des Satzes und ist ein logisches Resultat des fugalen Potentials, das sich im Material zum einleitenden Teil des Satzes angedeutet hatte. Die dynamische Energie der Fuge ergibt sich teilweise im Rückblick auf Beethoven, aber man hat den Verdacht, daß es Liszts Verwendung der Fuge als Vehikel moderner Vorstellungen war, die Litolff dazu angeregt hat, diese außergewöhnliche Passage zu komponieren. Liszt seinerseis, der Litolff und dessen Konzerte ungeheuer bewunderte, widmete dem Freund sein Erstes Konzert (1849; 1853 und 1855 revidiert). Wahrscheinlich hat Litolffs viersätzige Vorlage auch eine Rolle beim Aufbau von Liszts Werk gespielt, denn ein auffälliges Scherzo (samt Litolffs geliebter Triangel) nimmt auch dort die zentrale Position ein.